I was thinking the other day about conquering the laundry monster. Since I posted about that so long ago, the laundry hasn't made it to the living room, which is quite spectacular. Turns out I am a take up as much space as you are given kind of girl, so when I limit it to our little laundry room , it HAS to be folded right away. Speaking of laundry, I realized one thing I do like about the dreaded task, which led me to think about some other funny, as in weird, things that I like. 1) I love to put a load of laundry in right before I go to bed. The reason being: I hate doing laundry, but somehow I feel really good knowing that something else is working while I am sleeping. I'm a slave driver at heart. If those machines ever go union, I'm hooped. 2) I love garden centers. They are brimming with limitless possibilities. The colours, the shapes, the smells - you are only limited by your imagination, time and money. And time. And money. Really really limited by money. Garden centres, like Hardware stores are full of happy people amassing more work for themselves. We go there joyfully giving away our money hand over fist for the opportunity to add more work to our already busy schedules. After all, that verbena is just what your front yard, and it turns out, your life, was missing. 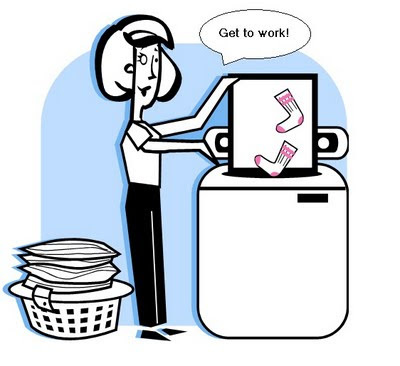 That is the reason your laundry is never folded, and your closets are mess. Yep, for 69 cents times 10 plants in 3 colours that verbena is gonna solve everything. Or am I the only one that feels like this in a garden centre? Note: I didn't even buy verbena...a trunk load of other things, but not verbena. 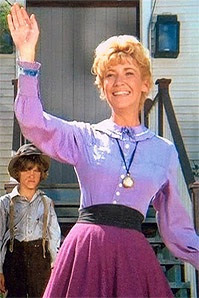 I just like the sound of the word - it reminds me of Little House on the Prairies. 3) I love getting really practical gifts. If I needed black socks, and you bought them for me, I would be completely thrilled. Do you remember the "black socks" commercial? That's it, three things that I like. What weird things make you happy? I’m not sure yet, if yesterday was a #fail sort of day, an #epicfail or just a #moderatelyfailingbutsortofsucceeding kind of day. I’m also not sure if using a Twitter reference and hashtags (#) is a good idea, especially when I don’t tweet, nor do I fully understand the whole concept of hashtagging (is that a word?) in the first place. I live on the precipice of technological competence, but only on the precipice. I sleep with someone who is immersed in the technological world, and absolutely is brilliant with pretty much anything to do with computers, networks, and the “internets”. In case you were worried, he also happens to be my husband. Anyway being so close to such technological brilliance lends itself to a bit of technological laziness on my part – hence, the ambiguity about hashtags...#lazy? The morning started out alright, although it may just be that I am a little over-sensitive having started the 17 Day Diet 4 days ago in order to finally lose the last 10, which should really be 15, but I like eating too much to care about the really last 5, pounds of baby bulge. I don’t know if you’ve picked up on the fact that my baby is almost 3. I know that diets are not a lifestyle change, they can be good for breaking habits. I say this based on the fact that I have done one other diet in my life, after I had the same problem with the baby bulge of 2003, and it did help me quite a bit, except for the two pregnancies that happened thereafter. #familyplanning? All of this to say that not eating any breads, chips, pop, candy, chocolate or anything that has sugar of any kind has perhaps contributed to my terseness today. I was led to believe that day three would be the hardest, and I rocked it...turns out I’m a hard day four kind of girl. As I said umpteen paragraphs earlier, the day started out fine. I kept it together for the little squabbles and issues that came about for the morning. And I ate a carrot stick. Yum. I had moderate control when there were a dozen kids in the school room making invitations for our school open house. I even kept moderate control as the kids and the other moms had the sinfully delicious looking rice krispie squares with nutella icing that our babysitter had made the night before. I should first point out that if I wasn’t so sure that our babysitter was an angel sent from God, I would think she was evil and hated me... but that’s just not the case. Secondly, I should also point out that my dear friends “took one for the team” and ate a second one in order to clean out the pan while I munched on a delicious Texas Red Grapefruit. They were only thinking of me. I didn’t even lose it when I had to assign some extra chores to a couple of kids for being a too sassy and disobedient at the lunch table. In the space of 20 minutes I went from thinking we were heading for a peaceful quiet-time to wishing that I would be struck dead and someone else would be left to clean up the mess. It started when the two that were given the penance/bathroom duty, put dirty dishes in the clean half-unloaded dishwasher, thereby rendering approximately one quarter of those that were left needed a re-wash. I may have had a bit of a growly tone when I explained that it was necessary to CHECK THE DISHES FIRST BEFORE YOU DUMP YOUR CHOCOLATE MILK DRIBBLES ALL OVER THE CLEAN CUTLERY. Maybe. I began madly unloading the dishwasher in a desperate attempt to clean the kitchen and get to the long awaited quiet-time, cause Thursdays are our busiest day and did I ever need it! Then Tyson came running into the kitchen and says quite matter-of-factly “Blech. Keaton is stinky.” This was not good news, because Keaton, believe it or not, is potty-trained. He is potty trained except for when he is upstairs sneaking into his brothers’ room and the bathroom door next to said room is locked as it is being cleaned by a certain delinquent child. If that happens, then it turns out that he will try to run to the downstairs bathroom. He’ll #notmakeit and then he’ll come to me in the kitchen, and he’ll have a very guilty and worried look on his face. He should have looked guilty because he knew what I would find: a trail of pee in the upstairs hallway, followed by smears of poop down every step and a lovely pile of hot steaming poop on the tile entryway. My afternoon just got #awesome. I put him in the nearest bathroom on the toilet, mostly just to contain him, while I went madly cleaning up hot, steaming poop, poop smears and pee trails. With four other kids in the house, this couldn’t wait. I may have been feeling a tad sorry for myself at that moment. I may also have been willing to trade a child or two for a cinnamon bun. Then I realized that the bathtub was being scrubbed, and I really didn’t want to carry him back up the stairs, and it felt a little macabre to stick a poopy kid in a tub that was being scrubbed that very minute. So I began to even more madly try and load the dishwasher to clear out a sink for a birdbath. I’m not even done yet. The poop is the stinkiest part, I’ll admit it, but I’m not even done...We are at about 10 minutes into the 20, in case you wondered. I rinse out the sink and flip the garberator switch to drain the sink. I stop it to find that I have destroyed two shot glasses. These surprisingly aren’t used for alcohol – although I might consider it after today –they are for espresso shots, made every morning for yours truly by the hot computer tech I wake up to every morning. They have been annihilated. It happens to be that one old one and one new one were wrecked, so I no longer have a matching set, which also may drive me to drink. At that point, I started shouting/whining/growling for help and towels at this point...keep in mind I still have a crying poop-laden almost-three year old trapped on the toilet in the other room. We still have 5 minutes to go – can you believe it? I quickly clean out the other side of the sink because it was clear that I must not use the side with the leaky garberator. The dishes are now in the dishwasher. I start it, cause I want to feel like I am #winning at something in my life in that moment. I grab the sorry looking three year old and gracefully wash him clean in the sink. Gracefully, much like bathing a cat is a graceful. I was totally feeling sorry for myself at this point. I wondered why, on a day when I needed extra grace that so much grace was being demanded from me. I didn’t have it in me to give. It left with the chocolate. My almost-three year old was now clean and in need of a towel, but there weren’t any nearby, cause they were just used to sop up garberator water. Are you wondering about the dishwasher? Cause you should be. This could have been a 19 minute catastrophe had I the good sense to realize that the dishwasher would empty through the same side as the garberator. It did. And water came forth. “Fortunately” everything had already been pulled out from under the sink, and I had a plethora of half wet towels readily available to stem the tides. I didn’t even need to shout or ask for help. For the record, it wasn’t all the water from the dishwasher, just whatever leaked through on its way to the main drain. And it only took a few seconds to fix the problem cause I was right there. #phew! My poor shivering child by this point had given up on ever being helped again by his pouty mother and was naked and curled up under his covers in bed. Thankfully he hadn’t fallen asleep like that, or the motherly guilt regarding the whole situation might have been too much for me. “It Cold-y” was all he said, clutching his favourite Spiderman PJ’s. I picked him up, and as I was dressing him, my indignant attitude began to melt. I realized how easy it is for me to let my feelings take charge when I things aren’t going my way. To think that life is all about me and how I’m feeling. I’m not advocating ignoring feelings at all – but I think it does more harm than good when I don’t control my feelings like I should. I rocked my clean little stinker. He gave me grace and love when I didn’t deserve anything but judgement and scorn. He relaxed into my arms like there was nowhere else he would rather be. Considering the flap I had been in only a few minutes earlier, that in itself was amazing. He asked me to sing to him, so I did. As I sang to this beautiful growing boy in my arms I began to feel remorse. I apologized for sounding so angry at everyone. And he forgave me- without a lecture or a disapproving look. And I’m almost thankful for that 20 minutes of insanity today because it reminded me again that my feelings about what is going on matter, but I need to remember that letting my feelings go on a rampage can be less that ideal. Emotions are real, they shouldn’t be ignored. I’m the first to admit I love adding excitement, exaggeration and what-not to my life. But letting feelings lead, especially when those feeling are frustration, self-pity and the like, can be dangerous. I don’t want to wound people with my words or tone. I want to run those feelings through a filter of grace first. Everything goes better that way, and I have far less apologizing to do. It's May. And while we should be overcome by the many, nay, copious or dare I say - pernicious plethora of flowers due to the extraordinarily rainy November December January February March April we've just had - we aren't. We have had a record two days in a row without rain though, and for that, I am quite happy. That, and we are doing a sight better than people in Brandon, Manitoba right now. Not fun. Do you like how I throw around vintage terms like "sight better"? I think deep down somewhere there is a pioneer woman waiting to be unearthed. All I am missing is a butter churn. Oh - and I don't mean THE Pioneer Woman, unless she happens to start reviving terms like "land sakes!" or "Heavens to Betsy, getcherself over here 'fore you plumb wash away from all this here downpour...." If anyone can bring it back, I'm sure she is up to it, but that's not what I meant. Speaking of butter churns and pioneer women, I went to my first homeschooling convention a few weeks back. We were able to stay with some friends that we hadn't seen in probably 10 years. They aren't homeschooling their kids, so I am sure they found our drooling over book catalogues, expensive timers and curriculum choices a little strange, but they loved us anyway and did a fabulous job of making us feel welcome. The good thing about the convention was that I was able to get most of my curriculum shopping done in one fell swoop. (Fell swoop, there I go again!) I saw some people (folks?) that I hadn't seen in ages and we sat in on a few sessions, and came away with a lot of things to think about in the coming weeks. I found it hilarious to bump into a couple of people that I had no idea were homeschooling. There was that moment of recognition followed by a moment from both of us where our eyes said "I'm not really here,like, not in that way" except we were both from out of town and there is no way you could be there by accident. Busted!! Fortunately, we were able to move on from that moment and laugh and make jokes and find out that we are both doing something that we had no expectation of doing 15 years earlier when we last saw each other. Good times. Funny thing since that conference, I have had a strange urge to sew a denim jumper and study Latin. The joke never gets old. Get used to it. I met again with a great group of women from our church at a book study we're doing on The Moms' Ultimate Guide to the Tween Girl's Universe by Nancy Rue or something like that. I'm only leading the discussion, it's not like I should remember the book title or anything. It's just so long, and my brain cells are so few. Having five babies will do that to you. I'm good with titles like Roots (Kunta Kinte), Animal Farm, The Pelican Brief or Grace Based Parenting. Anything with more than three words in the title gets lost in between loads of laundry and lesson planning. Having said that, it is a good book, and I am enjoying being with this group of women as we read through it together and try to figure out how we apply it to our families. The Part in Which We Find Out That Conservatives Do Not Cause the End of the World...At Least, Not Yet. Last Monday was a fantastic day for our family. My brother won the election in his riding, along with another 165 or so Conservative MP's from across the country. Canada elected the first Conservative majority government in over 20 years and wouldn't you know it, the sun still rose the next morning. Good thing the critics were wrong. :) I am excited for my brother to start this next chapter in his and his family's life. To celebrate this whole occasion of being elected to parliament, we decided to forgo joining the family to celebrate with my brother. Instead Keaton gave himself a concussion at the TQ (Kids Club at our church) wrap-up barbecue and we spent the evening in the ER waiting for him to stop barfing. He had a CAT scan, and I am pleased to report that all is well, despite his parentage. I considered taking him back to the Dr. a few days ago when he kept saying "no" to every request and thinking that everything he saw, or didn't see was his, and therefore crying about it, and having fits, and asserting his independence at the most inopportune moments, and then I remembered he is almost three, and still needs me to raise him. Oops. I wrapped up my stamping business and closed a very good chapter in my life. I will miss seeing these stamping friends as often, they were a unique part of my life. I am more than a little concerned that removing the pressure of creating will mean I don't create at all. Hopefully I have grown enough self discipline over the past 7 years, since I started, to keep it up just for fun. A girl can dream, can't she? I am feeling the May grind. So close the end, but not yet at the finish line. It's so tempting to put aside all the have-to's of life, and indulge in the want-to list. My have-to list is battling with my want-to list, I'm not sure who is winning sometimes. Enough whining already. 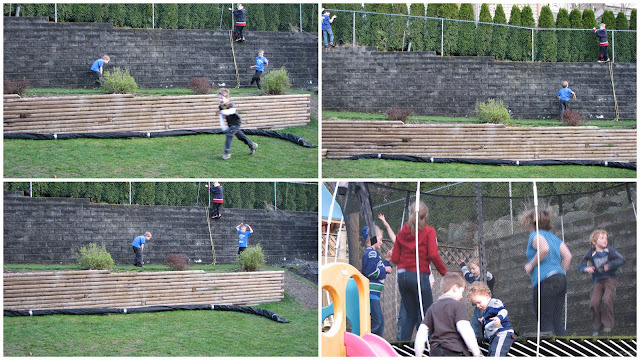 We hosted another big playoff party - it was so fun, and then Canucks lost. Again. It wasn't a blow-out like the last playoff party, but it makes me wonder if we should host another. My inner social butterfly is conflicted since they did redeem themselves and won the second round yesterday, when we were just us 7 watching the game. I did buy more chips in anticipation of more games to watch...don't let me down Vancouver! I have been asked to be a guest blogger on FamilyMatters.net. I am super-de-duper excited about that, cause I think they are just swell. I imagine they feel the same, especially when I use phrases like super-de-duper and swell. The problem is that I have no. idea. what. to. write. Figures I would have no end of things to say until someone asks me to say something! Brennan turned 10 a few weeks ago. I was, and am still trying to wrap my head around the fact that I now have two kids in the double digits. Brennan is wonderful, and ten is an absolutely magical age : old enough to begin to reason, but young enough to play, and play hard. Brennan's personality is very much like Josh's with a few dashes of my Mom thrown in for good measure. When you are around him, you will probably be asked a lot of questions about what you think and like, because he cares a lot about the details of a persons life. He doesn't have a great sense of diplomacy yet, in part because he asks so many questions, but I am sure more poise will come with age. He also questions himself as much as he questions others. He generally assumes he can't until little by slowly he realizes he can. We are intent on building confidence in him, and in true Brennan style: slowly, surely, and carefully, it's happening. He is sensitive and genuine and intense about the things he loves. He doesn't do half-way. Right now he is totally immersed in Lego and all things Vancouver Canucks, everything else is just stuff that has to be done between the next Lego project or watching the next Canucks game. I love Brennan a lot. In part because he reminds me so much of his Dad. I loved his Dad enough to marry him when I was ridiculously young. True story. In lieu of turning 10, I began to plan his birthday party. 1) I realize everyone who has children and writes anything: a letter, an email, a blog or has a conversation with anyone else about their kids says the same thing: they grow up SO FAST. It turns out they say this because it's true - they grow up SO FAST. "Brennan is turning 10 and it's unfolding exactly how I thought it would, his height, his personality, his interests are all right on target for what I expected. In fact I have had 12 different pre-planned conversations with him that I knew were totally necessary, because I am totally in sync with where he is in life." "What was that? No, I've never read any parenting books or burden my friends or my mother with child-rearing questions. That's unnecessary, because I innately know what to expect." 3) It would be a trend built on lies and false information...I would sit on a throne of lies and smell like beef & cheese, I am sure. Let's scratch that idea. 3) Beef and cheese...makes me think of Taco Time soft meat burritos - must have my yearly fix and soon. 4) Ten is a big deal. At least, I remember feeling like 10 was a big deal. I think I turned 10 the year my parents were building our house and so I think I had my tenth birthday while we were living at my Grammas...I think it was a princess party. Not because there was the Disney Princess mania that exists now, but because I really really wanted to be royalty, or more succinctly, the Queen of the World. I was willing to settle for being the Princess of A Lot, though. 5) It's unfortunate how little I remember about my 10th birthday party because my mom went to great lengths to accommodate every reasonable request I ever had for and of my birthday parties. I had a lot of unreasonable ones too - Kirk Cameron apparently wouldn't be making any appearance, and unicorn rides are hard to come by - but she always did great parties and made fantastic cakes. How can I do that same for Brennan? I'm pretty sure that Princess parties are out of the question. 6) I feel conflicted over liking soft meat burritos from Taco Time, cause I am sure they have little, if any, real beef or cheese in them. Mmmmmm....sacrelicious burritos. 7) I bet Brennan would like a hockey game to be involved somehow. Yeah, let's go for that. What started out as one small party turned into three birthday events, fittingly dubbed "Tenth-fest" by a friend of mine. It didn't start out that way, but it did grow into quite an, um, fest! Bren chose to do a very small party in order to see a live Abbotsford Heat (AHL) game and get a real Canucks jersey for his gift. I shouldn't have been surprised that he turned down the option of taking a bunch of friends to the game and foregoing the jersey - but we already discussed how I don't always know what to expect from my growing kids. It was going to be just Josh, Brennan and his best bud Luke going to the game. I am not sure if Luke's mom has forgiven Josh yet for letting them eat an unrestricted amount of hot dogs. Luke may or may not have made himself sick at home that night. Bren pounded back four hot dogs and held them down like a trooper...ok, maybe he does take after me a little bit. 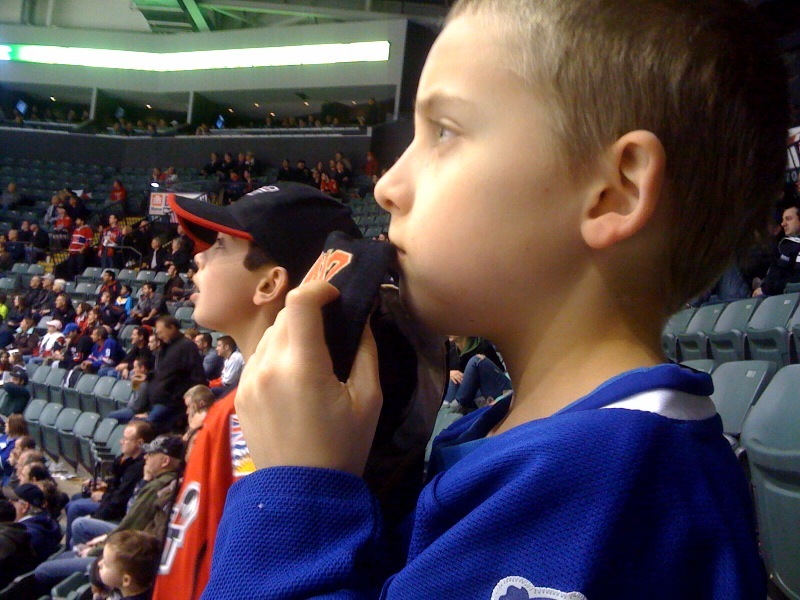 He does love him some hockey though - check out these guys on their way to the game. Peas in a pod, those two. They still had fun - unrestricted hot dogs, remember? This was originally going to be it for his birthday party. I didn't envision getting convinced to throw not one, but two more "events" in the following week. I am a sucker for a party and he knows it! In our home, sleepovers are a lot like unicorns in that they are very, very rare. Brennan really wanted to have Luke sleep over after the game, because sleepovers, unlike unicorns*, are only "allowed" after our kids 10th birthday has passed. It was clear this felt like a right of passage to Brennan, but the game day was a school night so it had to wait for the next weekend. Again, there was no cake, or treat bags, but we did our best to have an appropriate amount of junk food available for these growing 10 year olds. *For the record, we do allow our kids to play with unicorns whenever we happen across them. We're really lenient like that. 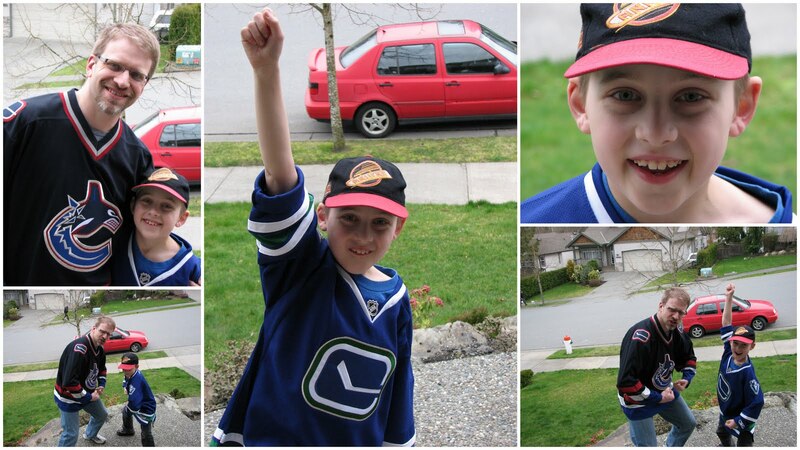 Our beloved Vancouver Canucks are in the playoffs. Hope springs eternal that they might win the Stanley Cup this year. Maybe, just maybe, after so many years of embracing the phrase "There's always next year" we will have our chance to win it all. 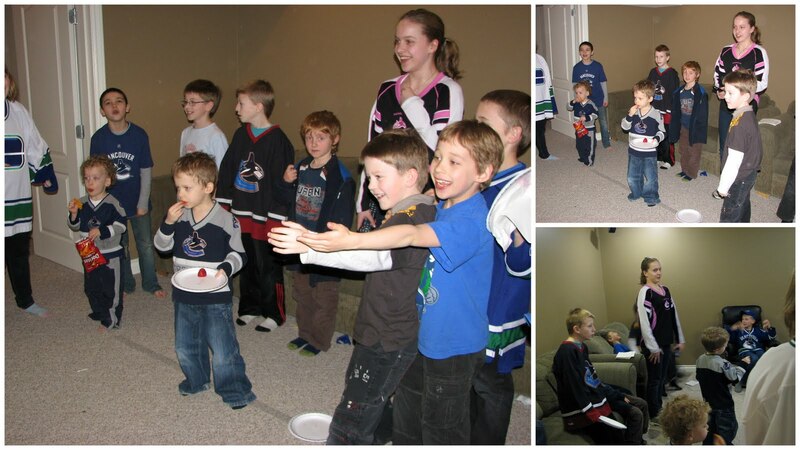 I am not a hockey fan, but I love a chance to eat a lot of food and make a big deal out of anything, so when Brennan asked if he could have a playoff party, cause there was, after all, a Canucks game the day after his actual birthday, and he hadn't had a cake yet, and he wouldn't even ask for presents, or treat bags, just for a party...how could I refuse? Instead of a cake, I decided to go for "cake-pops". For some reason this sounded like less work than making a cake. I can rock out a pretty decently decorated cake in about an hour. If you are under this same impression, let me save you the trouble and tell you to run, far, far away from making cake-pops, or as these turned out to be, cake-pucks for our playoff party. SIX hours later they were done. SIX HOURS LATER!!!!! I say this for posterity so Brennan will know how much I love him - I didn't even complain, but SIX HOURS!!!!!! In case you were under the impression I was tidy in my work. We painted the Canuck logo on our front window, had great "hockey music" blasting when his friends came over, we drank "Mean Green Sedin" soda, had blue and green chocolate dipped marshmallow, and as many other green and blue themed foods as we could think of. And pizza. Ten year old boys must be fed pizza in order to survive. It's on wikipedia and everything. And the Canucks lost. Big Time. I was so proud of how these boys, all rabid Canuck fans, were so willing to embrace "plan b" for the evening. Even more proud when Brennan, who tends to be a bit of a pessimist, led the way. The Canucks were supposed to win round one if the playoffs that night. And while it's only a game to me - it's a big deal to these 10 year olds. They all eat, sleep and breath hockey this time of year. However their team was losing, and losing big. The boys didn't even finish watching the game, they just moved on and made it a fantastic, memorable evening, without the Canuck win. There are going to be a lot bigger moments in their lives where they are going to need to embrace plan b - it's great to see them choosing to find joy wherever they are already.